When it comes to Safety Checks, you need to know your brights! Introducing Yellow Safety Side Tear Checks from CheckAdvantage. For this clean-cut design, our artist applied brilliant shades of yellow to the traditional field of wavy lines. 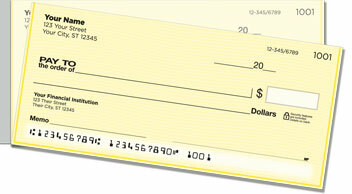 The result is a vivid set of checks that say a lot about you -- all good, of course! Because they're so practical, our safety checks are some of our best sellers; we just had no idea they'd look so good aglow! But don't worry if you're blinded by the light. You can also get our popular Safety Checks in sets of blue, green, orange, pink or purple, or as a multi-color offering that rotates between blue, pink, yellow and green. Choose yours and order today!